During the fall and winter months when it is getting chilling a bowl of soup just hits the spot! 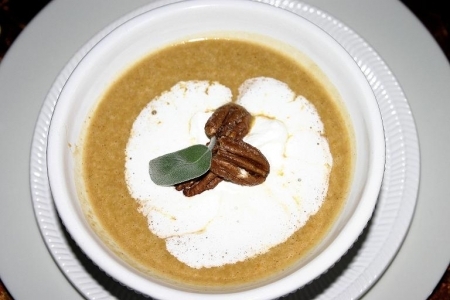 Use a fall favorite the butternut squash or buttercup squash and create a delicious soup for an appetizer or an entrée. Additional fall ingredients are added to make it a fall favorite! 1 butternut squash about 1 1/2 to 2 lbs. Cut butternut squash in half lengthwise. Remove seeds and pulp from the middle of the squash. Place in a cake pan flesh side down, fill with water a quarter of the way up the squash, cover with foil and bake in a preheated oven at 375 degrees for 45 minutes or until fork tender. Be careful when removing foil because hot steam will be released. When cool enough to handle, scoop out flesh and set aside. In a medium skillet sauté onions in olive oil over medium high heat. Add sugar and sauté until onions are caramelized. Remove onions and place in blender. Add squash, cinnamon, cloves, all spice, nutmeg and chicken broth. Blend to a smooth consistency. If contents of blender are near the top blend in batches. Transfer to a large pot. Take a half cup of water to empty blender to remove any excess mixture, and combine it with soup mixture in the pot. Simmer for 15 minutes on low heat stirring often. Once ready to serve. Ladle soup into bowls, add a dollop of cream mixture (see technique below), and add whole caramelized pecans (see technique below) and a sprig of sage. Serve with the chopped pecans in a separate bowl on the side. I am using a mix of whole pecans for presentation and chopped pecans for snacking on. In a medium bowl, mix all spiced pecan ingredients together. Coat a cookie sheet with non-stick cooking spray. Pour pecan mixture onto cookie sheet. Bake on the lower rack for 10 minutes in a preheated oven at 375. Check often. Once brown and sugar has caramelized, remove from oven and put aside until ready to garnish soup. Make unsweetened whipped cream by whipping the cream in a medium bowl with a mixer on high speed until stiff peaks form. If using Frangelica, stir in after cream has been whipped. Try Yalumba Viognier (South Australia), McManis Family Vineyards Viognier (California), Dogfish Head Punkin Ale (Milton, DE) or Michelob Brewing Co. Jack’s Pumpkin Spice Ale (St. Louis, MO).